Midwest, including the boating industry. Technology Co. in China. The business expanded to manufacture marine seating and boat interiors. 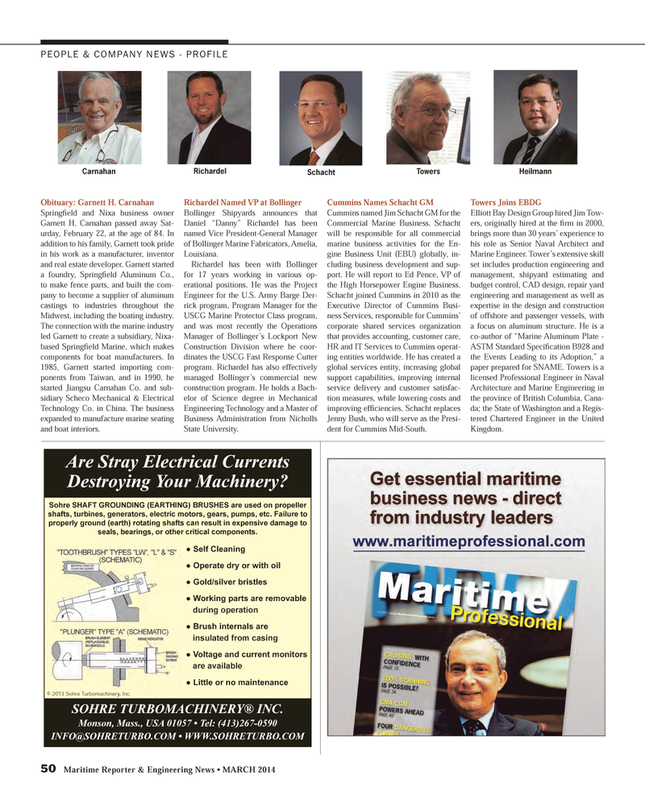 Commercial Marine Business. Schacht will be responsible for all commercial marine business activities for the En- gine Business Unit (EBU) globally, in- cluding business development and sup- port. He will report to Ed Pence, VP of the High Horsepower Engine Business. Jenny Bush, who will serve as the Presi- dent for Cummins Mid-South. Sohre SHAFT GROUNDING (EARTHING) BRUSHES are used on propeller shafts, turbines, generators, electric motors, gears, pumps, etc. Failure to properly ground (earth) rotating shafts can result in expensive damage to seals, bearings, or other critical components. ?  6 H O I  & O H D Q L Q J ?  2 S H U D W H  G U \  R U  Z L W K  R L O ?  * R O G  V L O Y H U  E U L V W O H V ?  : R U N L Q J  S D U W V  D U H  U H P R Y D E O H during operation ?  % U X V K  L Q W H U Q D O V  D U H insulated from casing ?  9 R O W D J H  D Q G  F X U U H Q W  P R Q L W R U V are available ?  / L W W O H  R U  Q R  P D L Q W H Q D Q F H © 2013 Sohre Turbomachinery, Inc.